Individually administered test assesses cognitive-linguistic deficits in geriatric clients in skilled nursing facilities. 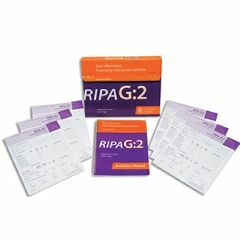 In addition to standard questions and stimulus items, RIPA-G2 incorporates questions from the Minimum Data Set used by nursing staff to provide correlational data. Efficient and effective in administration scoring and interpretation. Has “data at a glance” section for summarizing results for rehab meetings and client conferences. Periodic retesting provides objective data to assess treatment efficacy and document progress as is often required for Medicare and third-party payment. Completed in 45 to 60 minutes; supplement subtests in 10 to 20 minutes. 25 Forms included.